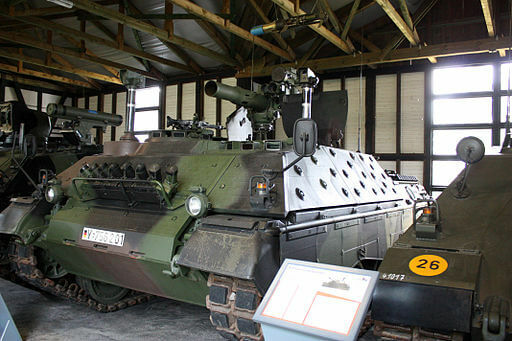 The Jaguar 1 and Jaguar 2 are West German ATGM-armed tank destroyers, also known as Raketenjagdpanzer 3 and Raketenjagdpanzer 4, respectively. They were conversions of earlier tank destroyers. The Jaguar 1 was converted from the Raketenjagdpanzer 2, with the SS.11 ATGM replaced by a HOT ATGM. The Jaguar 2 was converted from the Kanonenjagdpanzer. The gun was removed, and a TOW AGTM launcher was fitted to the roof. Both vehicles had upgraded armour, a 7.62mm MG3 on an AA mounting and smoke dischargers. The Jaguar 1 also had a bow-mounted MG3. Even with the additional armour, neither vehicle was heavily armoured, and so rely primarily for defence on speed and their low profile. They have an excellent top speed of 70 km/h (44 mph), and an operational range of around 400 km (250 miles). Both vehicles have a crew of four, all of whom sit in a fighting compartment to the front of the vehicle.